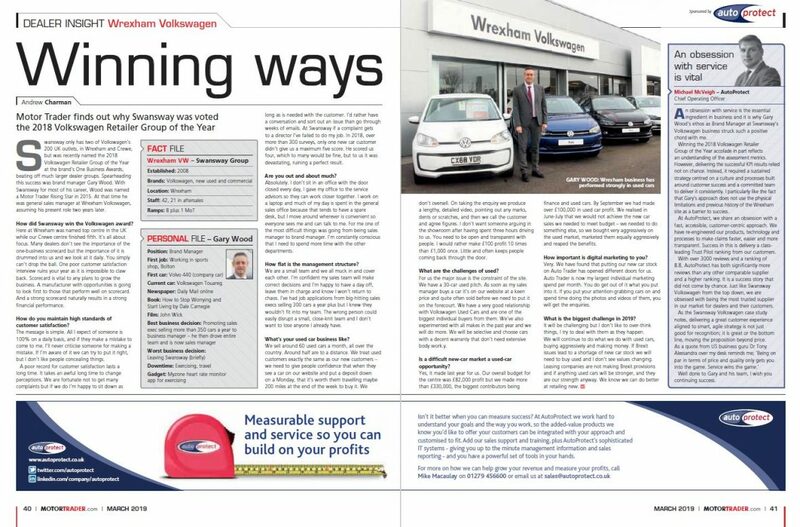 An obsession with service is the essential ingredient in business and it is why Gary Wood’s ethos as Brand Manager at Swansway’s Volkswagen business struck such a positive chord with me. Winning the 2018 Volkswagen Retailer Group of the Year accolade in part reflects an understanding of the assessment metrics. However, delivering the successful KPI results relied not on chance. Instead, it required a sustained strategy centred on a culture and processes built around customer success and a committed team to deliver it consistently. I particularly like the fact that Gary’s approach does not use the physical limitations and previous history of the Wrexham site as a barrier to success. At AutoProtect, we share an obsession with a fast, accessible, customer-centric approach. We have re-engineered our products, technology and processes to make claims faster, easier and more transparent. Success in this is delivery a classleading Trust Pilot ranking from our customers. With over 3,000 reviews and a ranking of 8.8, AutoProtect has both significantly more reviews than any other comparable supplier and a higher ranking. It is a success story that did not come by chance. Just like Swansway Volkswagen from the top down, we are obsessed with being the most trusted supplier in our market for dealers and their customers. Well done to Gary and his team, I wish you continuing success.